When DLF Universal opened Emporio as a luxury retail space in delhi south, They had planned to open Emporios all over India. 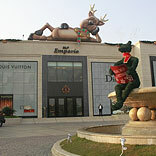 Emporio started functioning with over 170 signature brands within one retail space. But there was something which was not encouraging for the investor to come up with such luxury retail space all over India. The construction of such malls was put on a backburner. It was not because India did not have customers for such luxury brands. Growing numbers of BMWs and Audis on Indian roads make it clear that there is a growing percentage of population which is ready to become luxury sector’s consumer. A research suggests that luxury is a culture that becomes a part of life in five stages. Fifth stage means the peak of luxury. Japan has already reached at the fifth stage where luxury has become a part of the daily bread. China is crossing the second stage to enter the third stage whereas India has started the transition from the first phase to the second one which is also called ‘Show off Phase’. As the phase suggests Indians are ready to buy a product at a price as high as 12 times higher than the normal price, this has become a status symbol for them. To wonder what could be the reason for the customers to stay away from such shops, when pockets are heavy, brands and products are available, there must be something missing in between the customers and the brands. And that bridge was the service. A customer, who is ready to shell out his wealth 10 times more than the normal rate of products, is very often well travelled. He knows the customer service standards in the developed nation like Italy and Germany. He will always compare the service standard offered in the west with that in Indian luxury retail outlets. Indians lag way behind as of now. Brands in India have often experienced the shortage of specialized staff. Challenges are often the creators of opportunities. A number of international brands who have invested in India or are planning to invest in India, have hired specialised staff from their own countries. The salary that they have offered these brand managers is usually as high as Rs 3 Lakh per month. The reason is the shortage of skilled staff in India. This is the opportunity, and ones who have realised it as early as now have started grabbing the brands with hefty packages. On the occasion of the award ceremony for the first outgoing batch of Luxury Connect, CEO Abhay Gupta said, “We have identified customer service as one area and luxury brand management as other area. And there are no brand managers in India. If you go to Emporio , you will find all the foreigners sitting on the top. And such programs are costly. If you check the fees of such program in Milan, it will cost you 50,000 Euro. So there is need to groom the students here only. And since there will be a supply of brands coming to India in the coming years. There will be a high demand of specialized luxury professionals”. So the trends have started showing up. Opportunity is wide open. The bridge has to be filled. With more and more brands which will be coming to India as a result of allowed FDI, Luxury sector will see a lot of brands finding a retail space and thus enough opportunities waiting for the Indians to pick. SDA Bocconi school of management, Italy, has associated with Indian Luxury connect to develop more of such manpower.